Walking around these holidays we saw in the window of Ralph Lauren Ricky bag in pink. The bag name comes from the designer's muse and wife. The Ricky Bag has the highest standards in manual labor and has one of the most iconic silhouettes of the brand. 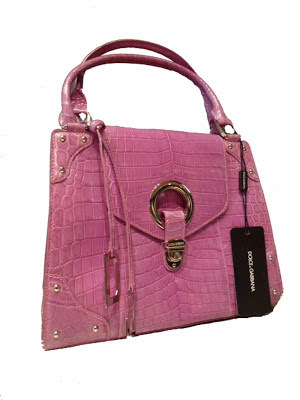 The model is available in crocodile leather and is priced from $ 22,000. Lo más curioso de todo es la similitud entre éste bolso de líneas clásicas y el modelo de Dolce & Gabbana disponible en nuestra página web para estrenar. ¿Con cual de los dos te quedas? The most curious of all is similarity between this bag with classic lines, and Dolce & Gabbana model available on our website.